The largest FEMA exercise of the year, a 9.0 magnitude earthquake along the Cascadia Subduction Zone (CSZ) and the resulting tsunami was the scenario posed to emergency management, public safety and ARES/RACES officials and volunteers in the Pacific Northwest, June 7 to 10. Cascadia Rising has just concluded with a large showing by amateur operators, and after action reports are just starting to roll in. Emergency Operations and Coordination Centers (EOC/ECCs) at all levels of government and the private sector were activated for this major effort. Whidbey Island, Washington, coordinated with local emergency officials and facilitated the flow of radio message traffic from their homes, emergency operations centers and field shelter sites during the four-day, multi-state exercise. The local exercise scenario called for a temporary breakdown of commercial communications facilities, creating an urgent need for amateur radio point-to-point communications. Members also hoisted antennas and forwarded Red Cross message traffic via voice and packet from a field triage site located in a community church on the island. 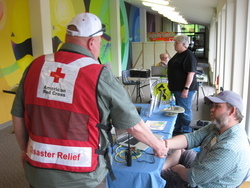 Andrew Phelps, Director of the Oregon Office of Emergency Management, said "Thanks to our amateur radio partners and Oregon ARES/RACES for your participation! Vital to our success!" (from John Core, KX7YT, ARRL Oregon Section Manager). Bruce Bjerke, K7BHB, Oregon Section Emergency Coordinator, Oregon ARES/RACES, reported that immediately following the exercise on June 10 during the hot wash with FEMA and the Oregon Office of Emergency Management staff, State Communications Officer Terry Pietras, W7JOC, introduced the ARES/RACES members of the State Amateur Radio Unit, highlighted their contributions, and stressed that they are all volunteers having contributed hundreds of hours in training and preparation for the exercise. Pietras also recognized the importance and performance of the county ARES/RACES units throughout the state. Earlier, the Director of the Oregon Office of Emergency Management, Andrew Phelps, KI7SIY, visited the radio room to personally thank operators. Bjerke said "we operated the FEMA National Radio System (FNARS), HF SHARES, 60 Meter Interoperability Net, FEMA VTAC, CAP radio, four VHF Regional Repeaters, the Winlink station, and the HF Net." One hour after the "ground shook" at the beginning of the exercise June 7, more than 45 ARES/RACES stations lit up the State ARES/RACES HF Net. Thirteen county EOC stations had been activated for the first day of play, and as many more became operational for situational awareness. Over the course of the next three days, more than 22 county units would activate and operate for periods of from one to all four days. Around the state, the activated county ARES/RACES units passed more than 300 Winlink and ICS-213 voice messages during scripted communications outages. Many other ARES/RACES units in other counties created their own local test elements, partnering with hospitals, the Red Cross, and other responders to realistically train for anticipated challenges. More on the Cascadia Rising exercise after action reports in next month's issue. Registration is open now for the 2016 ARRL Hurricane Webinar, July 21 at 8 PM EDT. Don't miss this opportunity to hear from a panel of experts on new developments and preparations for this year's hurricane season, which runs from June 1 to November 30. Fully updated, the second edition of the ARRL publication Storm Spotting and Amateur Radio is a valuable resource for the Amateur Radio operator who volunteers as a trained storm spotter. This book includes information on resources, training, equipment, safety, storm spotter activation procedures, reportable weather criteria, developing a local storm spotter manual, and the experiences of storm spotters from around the country. Purchase here. The running of the 43rd Shamrock Marathon and Half-Marathon took place on Sunday, March 20, 2016 and was a large, successful event. The amateur radio community was out in force to help for the 37th year in a row and with their planning and participation, a safe and well-staffed marathon was the result. The Shamrock Marathon is a Boston Marathon qualifier marathon. The Virginia Beach AmateurRadio Emergency Service (VBARES) has been in the forefront of helping the organizers of this event with communications services spread out over three days and five runs. On Saturday, the 8K run and two children's runs take place. On Sunday, the 1â2 Marathon and the Full Marathon are run. 30,000 participate as runners, with thousands more cheering the runners on. Many of the ARES volunteers have someone they know in the races. The amateur volunteers from the Tidewater area are placed at each mile marker along the course, at all water stops, and at the medical tent. They run supplies in vans, track the last runners on the course, provide a liaison with the local emergency operations center, and transport runners who drop out or request minor medical attention. A hotel room is provided by the organizers for the VBARES team to manage ARES operations and control the net. The Net Control team consists of six volunteers who spend the entire weekend at the hotel monitoring radio traffic and relaying information to the organizers. 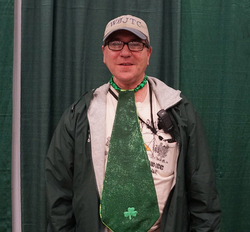 Shamrock Marathon op Steve Isenmann, W0JTC, in coat and tie. the organizers asked the local Citizen Band radio community to help with communications. Demand exceeded supply and in 1979, the function was turned over to the Dam Neck Radio Club of Virginia Beach, starting an enduring partnership between race organizers and Amateur Radio. George Schmidt, WA4GDB, led the initial efforts. As a youth, he built an HF radio to put on his bicycle, starting his mobile and public service careers early. Schmidt served the event for years, and turned over the reins to Al Crawford, WA4TCJ, and Tom Moore, WS9B. Crawford and Moore continued in their leadership roles through the years with a great support team from the Virginia Beach Amateur Radio Club (VBARC). Others have made significant contributions to the event. Planning for the event starts well before the March races. Recruiting volunteers starts in September with pitches at VBARC meetings. Moore starts to meet with organizers to listen to their concerns and offer suggestions. Meetings are also held with the Public Service Committee of VBARC. A Standard Operating Procedure (SOP) handbook was recently drafted for the volunteers/operators. Once the volunteers have signed up for the Marathon/Half-Marathon, individuals are assigned to specific locations on the course: 26 operators for the mile markers for the full marathon and 13 for the half marathon; others are assigned to the water stops, the EOC, as drivers and riders for two pick up vans, two supply vans, and the "Tail End Charlie" vehicle, which follows the last runner. Two operators are assigned as shadows for the race directors. Rounding out the assignments is an operator at the start and finish lines, and the operators who serve as net control stations and run the APRS assets. A total of 66 volunteer operators support the marathons. On the Thursday before the race, the mile markers and timing clocks are gathered from the race organizers and distributed to the hams per their assignments. A pre-race meeting is held that evening to receive materials and instructions, and be briefed on last minute changes. Materials include maps, and clock instructions. Safety vests are distributed to all volunteers. Event organizer J and A Racing provide handsome green jackets with each volunteer's name and call sign sewn on them for identification. On Friday morning, the vans are equipped for the race: the tail end Charlie van and the two pick up vans are fitted with mobile dual band radios and an APRS radio. Warning lights are attached to the vans, and water, blankets and gloves are put inside. The two supply vans are also fitted with radios. The lead vehicles have a radio and APRS unit installed on Saturday night. All vans are secured for pick up on race day. On Sunday morning, the marathon course is inspected for the proper locations of the mile markers and clocks. Operators then head to the hotel room to set up the net control function. The net control station equipment consists of two Yaesu FT-8800R dual band mobile radios supplied by the local ARES group, with two Diamond antennas strapped to the upper floor balcony. Two repeaters are used: one for north end of the course and the other for the south end. The net control station is located in the center of the course, yielding good coverage for the mobile and hand held units. The APRS receiver is set up and tested; several computers are booted up. Organizers give the hams a flash drive with runners' data to be loaded onto the net control computer. The day before, for Saturday's races, net control operators check in the course operators and net control responsibility is transferred to the start line operator who retransmits the countdown to the start, and then the start, for all operators to hear. The start line net control operator individual retains net control priority for several minutes. The operators on the course record and report the first three male and female runners to net control, along with any issues needing to be relayed to the race directors. Minor medical issues are reported to net control and a pick up van is dispatched to take the runner to the finish line or nearest medical tent. In the event of a serious medical problem, all radio communications other than the emergency communications are stopped, and the runner is stabilized and evacuated. When the 8K is over, the VBARC crew supports the other Saturday races. Sunday activity starts at 5 AM with the operators and net control finalizing details, and troubleshooting. Then, roll is called and on-course stations are checked in. call. The start of the Half Marathon is at 7 AM with up to 10,000 runners, followed by the full marathon at 8:30 with up to 4000 runners. As the runners are on the course, net control and the on-course operators track the runners, report injuries, watch for problems and try to resolve any issues that arise. As the day wears down, radio traffic is mainly runners' needs, supply issues at water stops, location of the vans and securing a mile marker or clock location when the last runner has passed through. The volunteer ham operator is free to leave once his station has been secured. Once the last runner has crossed the finish line, net control operators secure their station, pack up and leave. Radios, lights and APRS gear are removed from the vans, stowed, and the vans are returned. Race data is collected for the hot wash and planning for next year, and the operators head home. The Hospital Disaster Support Communications System (HDSCS) antenna team is starting its follow up at hospitals that exhibited problems during the Orange County (California) Multi-Agency Spring Drill. The HDSCS is a group of about 80 radio amateurs who have volunteered to provide backup internal and external communications for critical medical facilities in Orange County, whenever normal communications are interrupted for any reason. Last year, the HDSCS celebrated its 35th year of service. Most of the issues seem to be related to recent hospital remodeling or new construction. A few hospitals though, are moving their command centers, or adding an alternate command center, and now want HDSCS assistance to determine the best locations for antennas on the roof and the most appropriate locations for terminations of coax runs. Â· Your family needs at least three days of non-refrigerated food and bottled water available. Â· Have a medical kit available and make sure your family knows how to use it. Â· Have fire extinguishers at home; make sure your family knows how to use them. Â· Make your family aware of escape routes from the immediate area. Give them a map. Â· Pre-designate a place for them to go: a friend's house or alternate agreed-upon meeting place. Â· Have phone numbers in your wallet/purse for your family's alternate shelter(s). Â· Have alternate means of communication should cell/landline phone systems be down. Â· Consider registering with the Red Cross's Safe and Well service. Â· Keep valuable documents in a safe place or take them with you. Â· Have cash on hand for you and your family as ATMs will likely be down. These are just a few ideas; there are many more. Study FEMA's Ready website for more. The above list was adapted from the Department of Homeland Security - Office of Emergency Communications - excellent reference guide Auxiliary Communications Field Operations Guide (AUXFOG). FEMA, an ARRL partner, is calling on individuals and families across the nation to prepare for the 2016 Atlantic Hurricane season, which began two weeks ago and runs through November 30. The NOAA Climate Prediction Center outlook for 2016, released at the end of May, states the season will most likely be near-normal, but uncertainty about the formation of Atlantic storms makes predicting this season particularly difficult. ARES operators should already have plans and procedures, protocols, and frequencies in place, ready for emergencies and disasters spinning off from hurricanes. Inland ARES groups should also be prepared as severe weather generated by hurricanes can impact communities hundreds of miles inland. When a hurricane hits, it can bring high winds, heavy rainfall, coastal and inland flooding, rip currents, and even tornadoes. Storm surge produced by hurricanes poses the greatest threat to life and property along the coast. "The United States has not had a significant impact from a hurricane or tropical storm since Hurricane Sandy struck in 2012," said FEMA Administrator Craig Fugate, KK4INZ. "But luck isn't a strategy when it comes to being ready. If you live in a potentially affected state, you are at risk for storm surge, extreme winds and flooding during a hurricane. Now is the time for you to learn your evacuation routes and develop a hurricane evacuation plan. Prepare now and enjoy the summer with confidence that if a storm threatens you'll be ready." On HF, monitor the activity of the venerable Hurricane Watch Net on 14.325 MHz. The Net is a group of amateur operators, trained and organized to provide essential communications support to the National Hurricane Center. Net members are dispersed throughout North America, the Caribbean, and Central America for communications coverage from storm-affected areas to the forecasters at the NHC. Reports are relayed from the field to the National Hurricane Center amateur station WX4NHC. The primary mission of the Hurricane Watch Net is to disseminate tropical cyclone advisory information and collect observed or measured weather data from amateurs in the storm affected area as well as any post storm damage, and convey that information appropriately. The Hurricane Watch Net activates whenever a hurricane is within 300 miles of expected landfall. When activated, the net runs on 14.325 MHz during the day and 7.268 MHz at night. The VoIP SKYWARN/Hurricane Net combines both the Echolink and IRLP linked repeater networks for handling critical wide area communications during major severe weather events. The weekly VoIP SKYWARN/Hurricane Preparation Net meets every Saturday evening at 0000 UTC Sunday. Use the EchoLink *WX-TALK* Conference server Node #:7203, which is integrated with IRLP Reflector 9219. Have a fun and safe Field Day! ARRL Field Day remains the mother of all emergency/disaster/public event training exercises. Miss it at great expense to your annual training regimen. It's in two weeks! It is always held annually on the fourth weekend of June - this year, June 25-26. ARRL Field Day is the most popular (and in my opinion, the most fun) on-the-air event held annually in the US and Canada. More than 35,000 radio amateurs gather with their clubs, ARES groups or simply with friends to operate from remote locations, ideally outdoors in a true field somewhere. The experience and training gained from transporting your radios and antennas to the field, setting them up, using them as you would in an emergency/disaster/public event, troubleshooting problems, deriving efficiencies and effectiveness, and learning lessons and fixes to be applied for the next time, are arguably more valuable than any other training exercise, class or manual. Activate for this month's Field Day and make yourself a better public service field operator for yourself, your ARES member-teamates, and the public safety agencies and public event organizers and managers we work with during the rest of the year.